Following on from my last post, the practicalities of employing close to nature-continuous cover forest management are centered on maximising and or imitating physical events that occur in forests: natural regeneration (of new tree seedlings) and tree death (in natural settings this may occur from wind damage or lightening). This type of forest management is a form of biomimicry, where close attention is paid to natural processes. In this situation it is to increase the vitality, disease resilience, biodiversity and productivity (if one wants timber) of the forest. lucky for our forest which I will discuss later). For many years the conifers and hedgerows were left unattended; the conifers did grow, but some ever so very slowly as the ones that did formed a dark canopy that prevented light reaching the smaller, less vigorous trees. The hedgerow became a strip of many native trees and shrubs: Ash, Alder, and some Oak, with Hawthorn and occasional Holly. So many people told us that we should clear-fell our conifers and replant with broadleaves, if we were so keen on trees. And I expect many people still looking at our site wonder at preference for keeping our conifers and a rather straggly hedgerow. However our conifers are in a class of their own for establishing forests, as many European foresters have realised. Our Sitka spruce conifer has really important functions; for establishing a forest it is second to none in providing wind-shelter (planting native trees on bare ground is a heart-breaking struggle as many have now realised. All trees, and especially broadleaves do best with a forest structure around them); as a pioneer tree species it also shoots up fast (keeping other trees straight and lessening the need for their expensive manual pruning later on) and creates a canopy, which if intermittently broken, provides the right light conditions for secondary species like ash and then climax species like oak to thrive. And as mentioned, luckily for our forest-in-the-making, we have a very fortunate repository of native tree seed for our new forest from our hedgerow trees. Fungi are here too, that seem to like both the conifers and broadleaves; they are the network that really supports the entire forest. Our first step in transforming our conifer plantation into a forest occurred in April 2008. 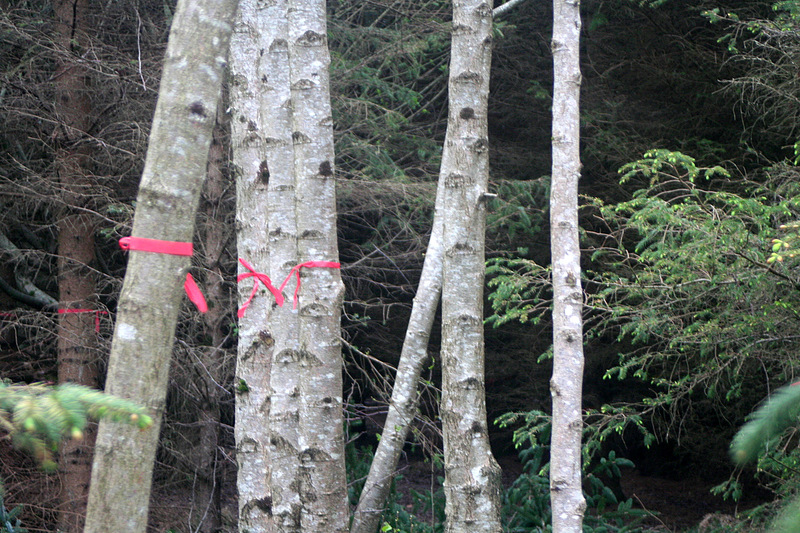 I asked then Chair of ProSilva Ireland, Jan Alexander (Crann founder) to give our neighbours and ourselves instruction on ‘tree-marking’ to encourage natural regeneration of our forest. This step involves identifying the trees that need to be removed to let younger trees thrive and to create enough light spaces so that seedlings may develop – many conifers in our forest were so close together that they were like bonsais, being only a few feet high after almost 15 years. Other very wet areas where native Alder trees had taken over, also needed to be thinned, as these trees had little chance of increasing in size with so many competitors. But before we could look at the trees to mark them, we had to remove a lot of the lower branches so we could get in and see which trees needed to go or stay. So our neighbours (including a Green Party councillor) were all given small saws to help with this – this is known as ‘brashing’ and the dead branches are put in piles to rot down (this is the film I made about why you do this). We had professional Close-to-Nature foresters do our felling for us – I’m lucky to know and have nearby ProSilva forest members to advise and the physical work in thinning this age of forest, even on just 2 acres, requires professionally trained foresters and took several days. As our site had never been managed there was some considerable effort in thinning the conifers too, as they had grown so closely together that they were like velcro – some had to be carefully pulled down. We got a huge amount of timber for our fire from that time and still have enormous quantities to get through. In our severe winters since it has been great to help our neighbours out with firewood. I documented the forest thinning stage very roughly in this video – its not an art video but does give an indication of what went on in 2008. We are actually overdue to thin the forest again as the regrowth has been astounding. Apologies in advance for the Hillbilly music! Great couple of posts, Cathy. A step by step of what happened that will hopefully help others in the management of other forests. Love the little film, – even the hillbilly rock! Woodland management can be hard work but always rewarding! Thanks Matt, I take it you are in Scotland, are you involved in this type of forestry management?